As I woke and rose this morning, gratitude was present but hibernating underneath the tarps and blankets of the “What’s Wrong” cataloguing crew. It’s as if there is a psychic equivalent of lymphocytes roving through our mind-scape–turning over every stone (and often uprooting flowers of joy and wonder)—in their myopic quest to seek and neutralize trouble (past and future). Just as in physical autoimmune disorders, these can over proliferate and turn the psyche upon itself, generate a story of chronic emergency that begets a culture of woe. I’m grateful that as I puttered in the kitchen, I became conscious of the subtle and pervasive shadow broadcast by these little soldiers–grateful that at least I have become conscious of what went on unconsciously for decades. As I was chopping vegetables, I caught myself–zones of my body– almost posturing a breathless salute to the propaganda, turning my own body and psyche into a soldier for the cause of chronic victimhood. This happened because I detected an irrepressible part of me admiring the head of cauliflower I was handling. And, just as quickly, I registered the cloud of suppression there to smother that, generated by an automated guard of defended-ness–a smog of the quiet rancor hanging over a heart set against a mad world. And I recognized that some time in vanishing history, this had become my psyche’s “default setting.” This impulse was so general, so accustomed, so seemingly natural that it masqueraded as a constitutional trait. But it isn’t. From experience, I know I can switch channels, select another lens through which to focus my attention, my light. I can choose differently. Moreover, there is the hope this repeated over-riding will reset the default. This background hum of pessimism is a trait shared with those who populated my formative environments. I remember characters and institutions throughout my life that exuded this mood and attitude, convincing me it was normal, natural, sensible. It is simply conditioning, inheritance. And I am innocent and forgiven. And I am willing to be grateful, even though I lament that I automatically default to ingratitude as an áffect I took on somewhere: one which, in spite of ample transcendent wisdom, still colors my world; one for which I have not yet been able to access the settings and permanently alter the default. As I feel into it, I recognize it as preemptive anger, a way of protecting the heart with a camouflage of cynicism. It is so very subtle; but it is constrictive, the way the fingers curl around to protect the tender pads and palm of the hand. Without it, when I choose differently, the soft self naturally opens and swells with rising wonder and innocence. The ground of being dissolves from parched earth into a dew-drenched moss beatitude. And I am so lucky to be able to feel that. It is Life. mutes the green fire of Spring. 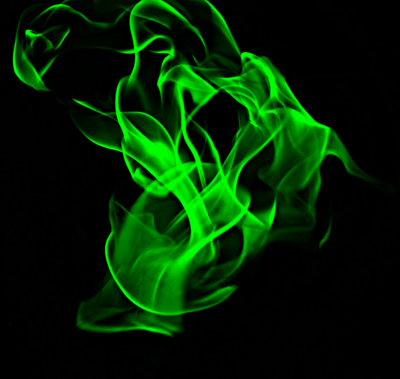 a green spirit appears in the flames. but I rise to the magic it brings. and renew life’s mysterious Bling. In the hours after my double-header endoscopy/colonoscopy this week, folks have asked me how it went. When I would say “It was a really good experience,” there would be a pause, and searching eye-contact, as they would wait for the laugh or grimace that would confirm the sarcasm they were trying to find in my delivery. It never came…. Nor, in most cases, would come much more explanation. Here I skip to the end, where the juice was for me. Oh, look, isn’t the the sweetest appendiceal orifice!? And what a precious, healthy and well-vasculated Duodenal Bulb?! Imagine! only one polyp in 25 feet dewy pink intestine! Since I’d have loved to watch the procedure on a screen, like others I know have done, I really am very grateful for the pictures. They make it all “real” somehow, more trustworthy and also more miraculous. My father talked about his ileocecal valve for years. But I have seen mine; I’m that much closer than he ever was to empirical certainty of what most of us only imagine, speculate on and take a text book’s word for is actually inside the formless field of sensation we “know” our body to be, beneath the derma. Dad was fascinated with bodily function, like he was with all well-designed man-made machinery. And he was subtly in tune with the energetics of his own body. But his mind could bias his interpretations of those sensations. And his bias against the misguided medical system deprived him of the delights of visual aids, until his illness had deprived him of the capacity to enjoy them, when the medical system got hold of his own malfunctioning body (and brain). When his wife broke her patella years earlier, and they made a rare foray to the medical world, he developed and enlarged a “negative” of the X-ray for display. She was discomfited; he was delighted. We are conditioned to value the visual sense most in this culture; and his voyeuristic photographer’s eye could not resist. Frankly, I’m with him: there is such beauty and even mystique in those glimpses into the insides of us, which, until we get a picture, is all just hearsay and myth. So, those entero-scopic pictures made it worth the trip; they are, after all, my only memories of the trip. Because the other best thing about the trip was the trip itself; the trip to Nowhere; the timeless, spaceless interval in which the clock hand moved about 40 minutes, and I got to not exist--what a relief!– until I heard my name and responded, almost involuntarily, as if snapped back into a dimension where I do apparently exist. Of course, while I was nobody in Nowhere, I could not appreciate not existing. It was only in those precious moments after emerging that I felt swathed in TabulaRasic innocence and a fulsome wave of nostalgic grief: a memory, quite literally, of sweet nothing. And I gave myself to this delicious, pure and primal grief for a few minutes. And I gave myself also to fully sanctioned flatulence. The voice who called me back told me that my colon had been inflated with air for the procedure and I would be passing gas. It was encouraged to. So while one end quietly and contentedly sobbed, the other end bugled with equal satisfaction and naturalness. Here in this chamber of unspoken secrets, the colonoscopy recovery room, one could weep and one could fart with commensurate impunity. Once in the special waiting room, where post-op patients wait for their rides, relearn both to use their cell-phones (despite the “no cell phone sign) and sit upright like a standard Homosapien 2.016, I scribbled a little “poem” with the last ink in my pen. I posted it briefly to my blog, naked and without explanation, then I moved it to the verse page. But I repost it now, more suitably introduced. and I was there to answer and didn’t even know it. the Habit of Sentience activated by my name. just this side of The Veil. Yesterday, or so, I happened upon a poem by Jose Alcantara, in the On Being blog/newsletter. They both, in brilliantly different ways, point to the same wisdom, the wisdom of non-avoidance, and the fact that life is a messy experience, and we can choose to focus our attention more on the experience or the messy. The world is feeling mighty messy lately, and so as we reach down into our heroic souls for courage and quietude, these poems make a good cheering section. Still, homey and woven through with birdsong. This heart rests open in the cool, blue dim. The eyes dilate to drink deep the nourishing gloam and damp. transfiguring the moors of Bronte into the vivid desert of Okeefe. The belly of that robin is almost glowing. He is singing, I am sure; but I can’t hear him. the one that rarely stirs, sheltered against the house. which stand just where they were yesterday. Niles has changed the spelling of his name: N-I-H-I-L-S .
“If you can’t beat ’em, join him,” he says. What would I change my name to? from the inside out, like the caterpillar’s. It would not have letters, this name. Letters are noisy; they are meant to be. And words are rusty gates.